Far Eastern fish fly, crawl, squeak and smell like cucumbers. Primorye, a territory of southeastern Russia 9,000 kilometers away from Moscow, is a hybrid of Arctic Alaska and sunny California and of the harsh frosts of Siberia and the warm climes of Crimea. Local forests combine elements that otherwise would not go together, such as deep snows and tropical tigers. Local waters are home to subtle but fatty northern fishes and brightly colored fish types that are usually only found in southern waters. The best areas for industrial fishing in the Far East are Okhotskoye, Beringovo and the Sea of Japan. Here, Pacific salmon live in the cold northern waters – humpback salmon, chum salmon, coho salmon, Chinook salmon and masu salmon. Northern fish is a beneficial export food and even countries like Japan, Korea and China – all countries featuring large fishing industries – buy fish from Russia. In Soviet times the Far East coast was populated by a chain of fish-processing plants and the sea literally swarmed with seine boats, trawlers and factory ships. Up until the 1980s, Vladivostok, the capital of Primorye, was the center of the whaling industry, but a 1986 moratorium on commercial whaling changed all that. Today the scale of industrial fishing is much more modest, but fishing remains a crucial sector of the region's economy and an important component of the lifestyle of local residents. The concept of sport fishing – when caught fish is thrown back into the water – is almost unknown here. Most people in the Far East eat whatever they manage to catch with great pleasure. One of Vladivostok's most important fishes is smelt. It is caught in the winter from under the ice covering the Amur gulf and nearby bays. Freshly caught smelt smells like a fresh cucumber and is usually fried or wind dried. There was a time when bunches of smelts were hung to dry in every Vladivostok window forming a kind of a curtain. Another winter fish is saffron cod, which is crisp and flavorful when fried. Spring is the season of flounder and Alaskan pollock. Fishing for flounder is easy: all you need is a rubber boat and a leger rig with a hook and some bait (a worm, a squid or a mussel). 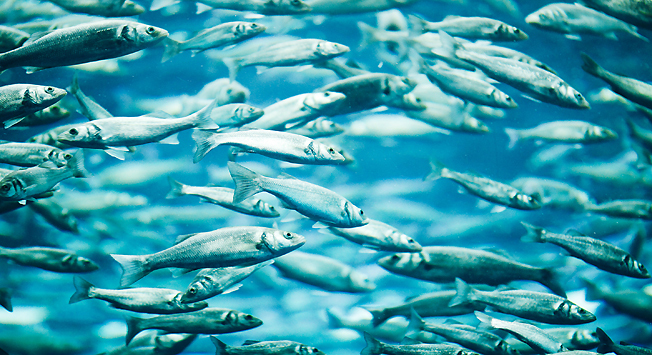 Fall is the season of Pacific herring, which is twice as large as the Atlantic variety. Amateur fishermen do not need any licenses here. A popular form of entertainment here is night fishing for calamari that are attracted by light. For fans of underwater hunts there are also opportunities to fish for Japanese amberjack (or yellowtail) and other fishes. Other fishes that live here include so-iuy mullet (a relative of ray mullet, the flying fish known for jumping out of the water and making several leaps in a row), red-eye and sea perch. Sharks are often seen and even the deadly and poisonous fugu (pufferfish) comes to Primorye’s shores from the southern waters. According to scientists from the TINRO Center (an institute that researches the resources of the Far-East’s seas) Pacific sardines returned to Pacific waters this year. Millions of tons of sardines were caught in Soviet times, which caused the collapse of the Pacific sardine population. During the summer beach season Primorye residents “hunt” for mollusks (scallops, mussels and spisulas, also known as surf clams). These mollusks can be found at a depth of 2-3 meters. There are oysters living in Vladivostok’s waters (the writer Anton Chekhov who traveled here in 1890 mentioned their large size), but locals don’t like them for some reason. Instead Primorye inhabitants love eating sea cucumbers and sea urchins. The well-known Vladivostok rock singer Ilya Lagutenko (from the band Mumiy Troll) once suggested renaming one of the city’s streets Sea Cucumber Prospect. River fishes in the Far East are equally versatile. In the basin of the Amur, the biggest river of the region, there are sturgeons, snakeheads (a fish that can crawl considerable distances on land when necessary) and bigheads. There is also an amazing river fish called the yellowhead catfish: when taken out of the water it squeaks loudly and engages its sharp prickles. In the translucent cold waters that flow down the mountain slopes you can find the cleanest and noblest kinds of fish imaginable, including lenoks, graylings, brook trouts and taimens. Fish markets in Vladivostok are not as large as can be found in Busan, Dalian or Osaka, but it is still possible to buy fresh and frozen local fish, seafood and different kinds of caviar. Good markets include Beryozka at Vtoraya Rechka station, and those found at Sportivnaya, Naberezhnaya and at Pervaya Rechka. Red caviar is sold at Vladivostok's airport, but it is more expensive than the market price. Often crab, shrimp and caviar are sold from trucks by the side of the road. Look out for signs. Primorye authorities promise to build a large, new fish market in Vladivostok within next 2-3 years, like the Tsukiji market in Tokyo. The building will be designed to look like a huge ray fish. The location for the market has already been selected at Korabelnaya Embankment. As for restaurants, Far-Eastern cuisine (including seafood dishes) can be found at Port-Cafe on Komsomolskaya ul.